Gary Carlson is an American comic book writer, editor and publisher. Gary self-published and created the black and white superhero anthology Megaton back in the early ’80s, which introduced many new comic book talents including artists Erik Larsen, Rob Liefeld and Angel Medina (to name a few) as well as featuring the work of Butch Guice, Mike Gustovitch, Sam Grainger, Sam DeLaRosa and the late Gene Day. Gary Carlson co-created Vanguard with comic book artist Erik Larsen. Carlson later wrote Vanguard and Teenage Mutant Ninja Turtles as well as Supreme for Image Comics. He also co-wrote Aquaman and Nova with Erik Larsen. 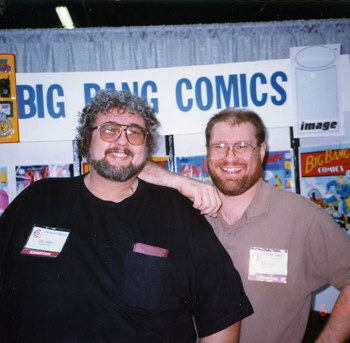 Carlson is the major creative force behind Big Bang Comics, serving as editor, writer and publisher. The series was originally published by Caliber Comics, then Image Comics, and is now self published under the Big Bang Presents title.